Posted by taryn in best books ever, fantasy. What do you call two books in a series? A twinset? Musings aside, this is another great offering from Orbit, one of my favourite sf&f publishers. A fast-paced classic fantasy tale, this is one of my must-reads. Asher is a strapping young fisherman living in a small fishing village of Lur. He heads to the big city to make a bit of cash to buy his own boat and look after his Da. He scores an excellent job liaising between the races and advising the young and magic-less (and disabled) Prince Gar. Lur is ruled by the Doranen, an arrogant and magical elf like race. They escaped to Lur from the evil tyrant Morg and now a magical barrier is all that protects them. Asher is an Olken, one of the original inhabitants of Lur. They are banned from using Doranen magic, on penalty of death, but rumous abound of their own ‘earth’ magic, forced underground. Asher of course has loads of this new magic, is the prophesised one and is pulled this way and that as Morg tries to break the barrier and underground Olken magickers try to use him. The characters are fascinating and flawed (kudos to another strong female character) and the world itself is very entertaining. Love the magic scenes, the weatherworking (love a bit of blood in magic). The world Miller has built is very cool and easy to get absorbed in. The Innocent Mage and The Awakened Mage are called the Kingmaker, Kingbreaker series. I read these back in October 2007 and have also passed them over to my 14 year old sister who loved them. Albeit she found the ending not quite to her liking and a bit depressing. Read an extract of The Innocent Mage and The Awakened Mage. 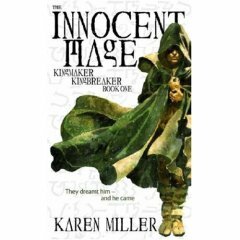 The Innocent Mage (Kingmaker, Kingbreaker 1), Karen Miller, Orbit, April 2007. 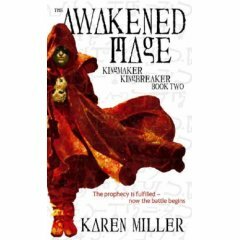 The Awakened Mage (Kingmaker, Kingbreaker 2), Karen Miller, Orbit, September 2007. Maybe I was wrong, but I fully expect a third novel to this, Book II doesn’t seem to end the story just yet.